There have been several items of French ” Hunting ” kit that have given me ideas and this is one of them. Our double gun strap is a copy of the French double gun strap but we have modified it – ours are made from wide webbing not narrow leather. 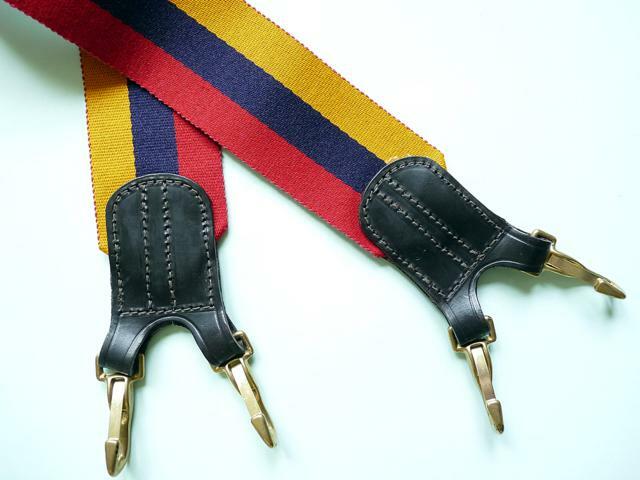 A simple wide coloured webbing strap with four attachments – two at each end – each to attach to the four D rings on the two slips. 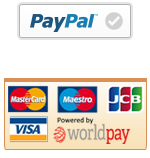 This system is so simple and quickly modified from a pair to a single. Our Double gun straps are simplicity itself – at each end of a length of the webbing we attach a large D ring onto which two straps and buckles (four in total) are attached. 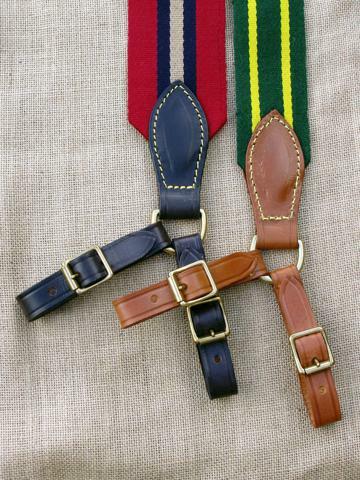 Two of these straps buckle directly onto each slips two D rings – two at the top and two at the bottom. The original double gun straps were made from 1″ wide leather but I choose to use our wide colourful webbings which I think suits the whole concept of shooting double guns; the Loaders like them because they may have 18lbs weight on their shoulder, usually with skinny leather straps which are uncomfortable; our Double Gun Strap is a single wide strap holding the two guns together, it is probably 3″ wide, very comfortable and doesn’t slip off the shoulder. 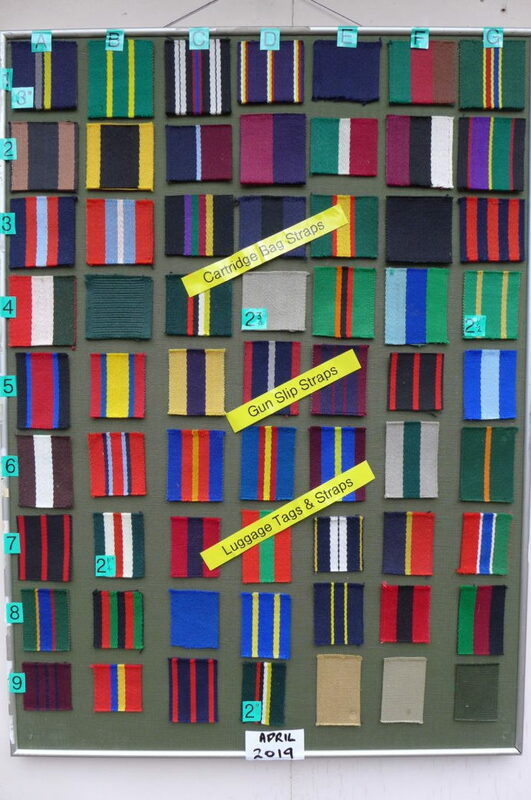 The boss likes them because at a glance he can see the straps over his loaders shoulder which tells him where his peg is and to this end – choosing a brighter colour then the better. Also his valuable slipped guns can not be banged together because they are held together, nor will he have the horror of watching one of his guns slip of his loaders shoulder as the loader bends down trying to disentangle himself from two thin leather straps and probably two cartridge bags. A 150 cartridge bag and a double gun strap both with the same webbing in a bright colour will add considerable efficiency to the “big day”. 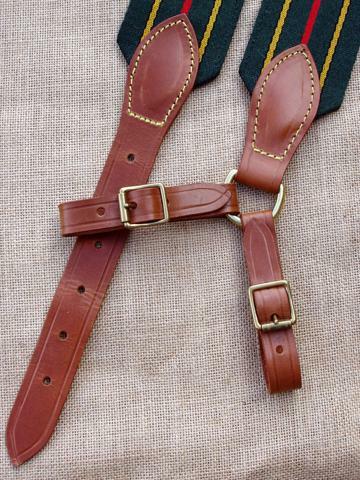 The other interesting practical advantage of this strap is that it converts to a single gun strap in 20 seconds – just undo the two buckles on one slip and this frees the other slip from its partner and the double gun strap becomes a single gun strap with one slip attached. If you wish to perhaps lend the other slip, then I would suggest the purchase of another strap of the “quick release” type. This clips onto the other slip and allows it to be used separately. Thanks to Robbie D.M. 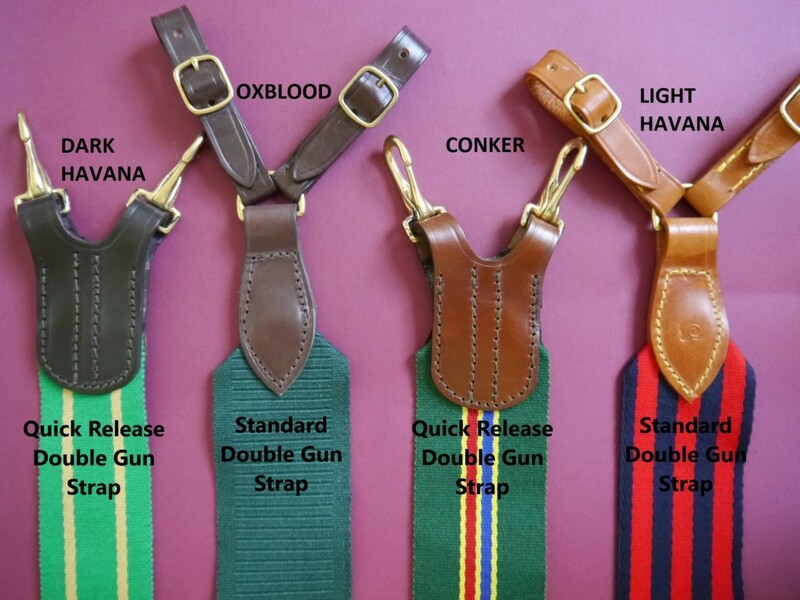 we now have a variation on our double gun strap; instead of a double gun strap with 4 straps and buckles I can offer the same strap but with 4 solid brass spring loaded clips which take even less time fit than the buckles. The other advantage of this arrangement is that the webbing finishes closer to the slips giving better purchase on the loaders shoulder.